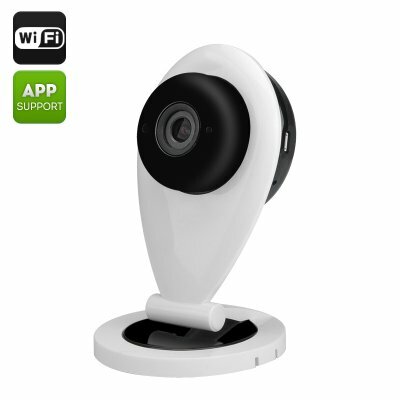 Successfully Added Eye Sight ES-IP840 Mini IP Camera - Wi-Fi, 720P, 1/4 Inch CMOS, 0.8 Lux, Mic + Speaker, Phone App, Motion Detection to your Shopping Cart. The Eye Sight ES-IP840 camera brings discrete recordings for unseen surveillance. This compact IP camera is the perfect way to keep tabs on your home when your away at work, the shops or on holiday. With a dedicated phone app you can set up this Plug and Play camera direct from a Smartphone or tablet and the Smart Home Cloud app is available for Android or iOS devices. With a built in microphone and speaker the ES-IP840 mini IP camera can be connected to you PC or laptop for video calling or even double as a baby monitor keep a watchful eye over your loved ones as they slumber and notifying you of any interruptions in the night. No matter how you wish to use this camera you will enjoy detailed high definition 720p video that can be viewed directly on your Smartphone, laptop, tablet or PC from wherever you may be. Utilizing H.264 video compression and with 64GB of storage supported via the micro SD card slot there's plenty of space to save the cameras footage. Program this IP camera to send you and e-mail alert whenever the motion detection is triggered and keep your home protected when your away. Operating at a minimum illumination of 0.8 lux this HD IP camera makes a great nanny cam, baby monitor, baby cam as well as surveillance camera and will bring you audio as well as visual data for greater peace of mind. The camera has Wi-Fi capabilities so you can set it up in any room without having the hassle of wires and leads as all you require is a power point. This also lets you move the camera easily so it can fulfill many roles and bring you closer to the family while away from home. The Eye Sight ES-IP840 Mini IP Camera comes with 12 months warranty, brought to you by the leader in electronic devices as well as wholesale Surveillance Cameras..